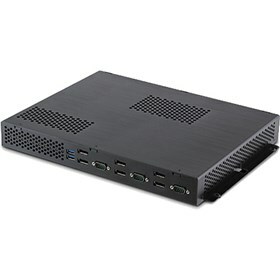 The NEC NETPC-BD6C is a robust multi-port computer that offers full PC functionality with multiple video outputs for simultaneous video playback. It is ideal for commercial applications such as digital menu boards and airport flight information displays (FIDS), which require a low-profile form factor PC, thus all-in-one computer solution is compatible with all NEC large-screen displays . The AMD Bulldozer architecture is protectd by its all-metal chassis . Users are provided with 8GB DDR3 RAM and dual 250GB SATA hard disk drives for storage by NETPC-BD6C . The NEC NETPC-BD6C has many exciting features for users of all types. See the NEC NETPC-BD6C gallery images above for more product views. The NEC NETPC-BD6C is sold as a Brand New Unopened Item.